2015 Best in Reliability Companies Award Winner! 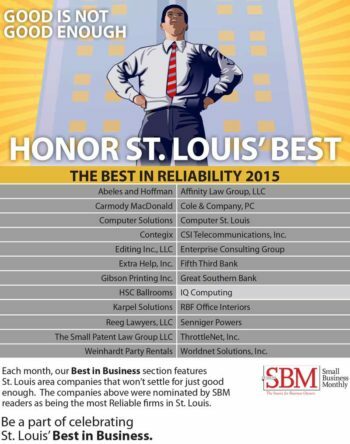 In recognition of one of the values that defines our customer experience, IQComputing was recently awarded a “Best in Reliability” business in 2015 by the St. Louis Small Business Monthly. According to the decision making body, IQComputing was an award recipient out of over 200 companies, highlighting our continuing efforts to maintain high reliability when it comes to all facets of our services including email, St Louis web design, web development, and support. Our customers continue to enjoy the level of reliability that sets us apart from others and we look forward to maintaining this level of quality. When was the last time you could say that you can reach your website design firm with just a few rings? We work to ensure that our customers don’t have to deal with complicated phone trees, multi-layered management hierarchies, and above all, days of delays to answers, requests completed, or just to speak to someone in a timely manner. IQComputing takes this approach and applies it to everything that we do when it comes to supporting our valued customers in St. Louis, Missouri as well as areas around the United States and beyond. If you aren’t satisfied with your current web designer or if you have had a negative experience with other St. Louis web design companies, maybe it’s time for a change. Refresh your website, make it responsive, and talk to a local team of in-house professionals who can make a difference without the aggravations that may arise from dealing with a traditional agency point of contact who isn’t available to take your calls. Your website should be reliable as well should be your email services. IQComputing makes this possible for small businesses as well as mid-sized companies and we can do it for you too. Available in the April, 2015 print release, readers get to see for themselves this tribute to IQComputing’s commitment to our customers! Please note that award recipients are sorted in alphabetical order.